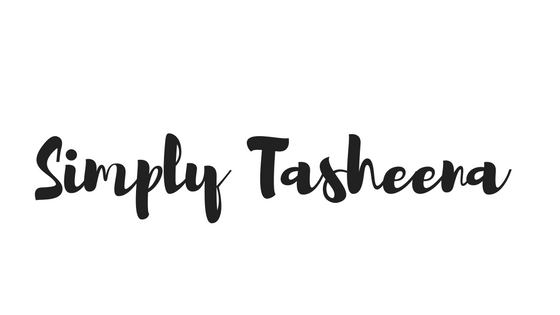 This blog post is sponsored but the ideas and opinions are 100% my own. 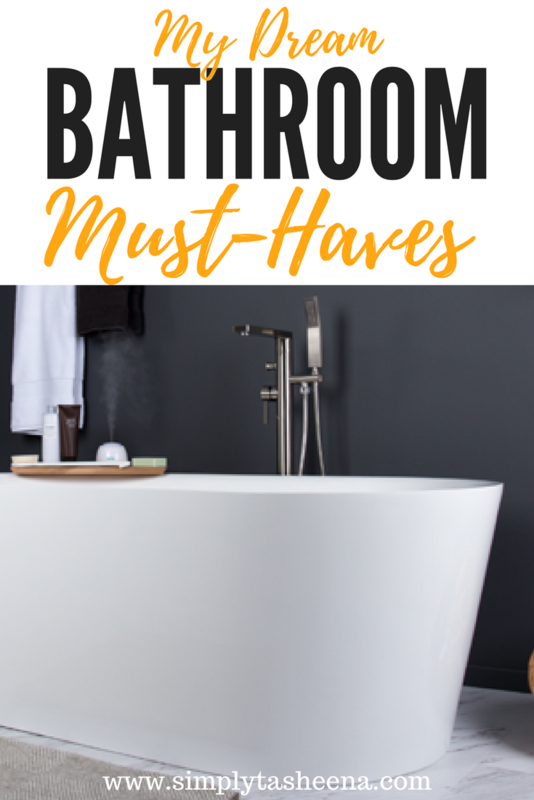 Today I'll be sharing with you what's on my Dream Bathroom Must-Haves list. We're still living in our first home. We're eager to move into our dream home and/or do a bathroom renovation. I can't wait to share with you guys the details. The most amazing part of this process is that I'm already getting my design ideas today and pretty much have a clear vision of how I want my Dream Bathroom to look. I'm sure this decision may come easily to some. However, I'm torn between getting a claw foot tub and a freestanding tub. I truly love the look of both tubs. However, there is something that I love about both. I love the antique look of a clawfoot tub and honestly. I fell back in love with it when my sister purchased her home and her master bathroom had a claw foot tub that was original to the home. Can we say Yes, please!! Then comes staying at a luxury resort or hotel and falling in love with a freestanding tub facing an ocean view with panoramic floor to ceiling windows. A girl can dream right?! 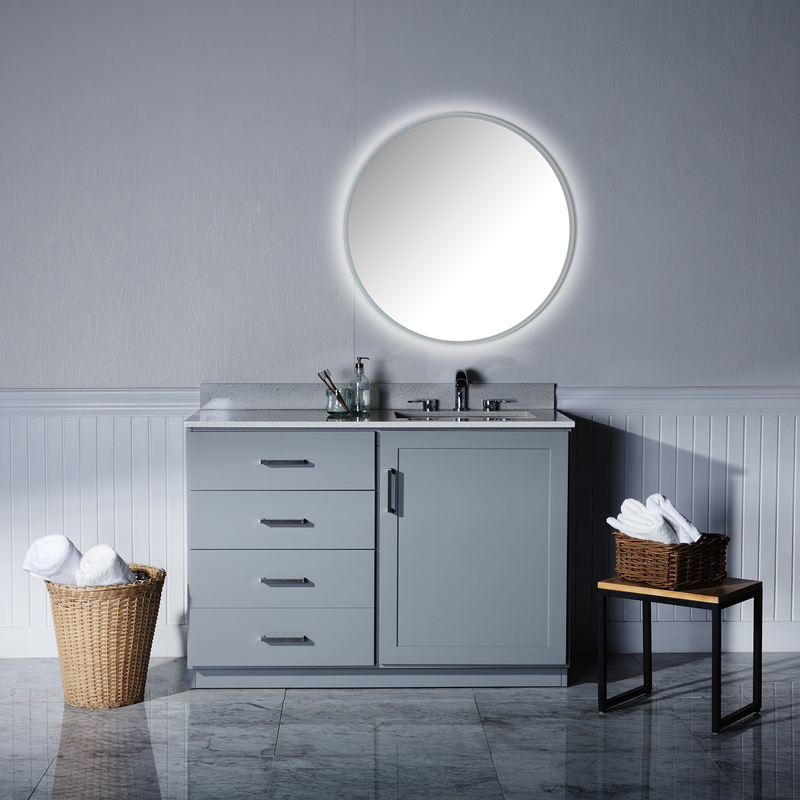 When it comes to vanities I'm starting to fall in love with the contemporary vanities. There's something about the clean lines that match perfectly with a freestanding tub. As of right now, I don't have a color theme in mind for the vanity. However, I would love for it to look like a piece of artwork and not just a bathroom fixture. I'm huge on maximizing ever nook and cranny of my Dream Bathroom without giving that unorganized crowded feel to my bathroom. I would love an oversized mirror medicine cabinet to store all of our bathroom essentials. For the bathroom lighting, I would love to have clear crystal chandelier right above the tub. I don't think at this point that I want it to oversized. However, I would love for it to have a nice sparkle above it. Of course, I would have resist lighting throughout our bathroom as well. Of course, our bathroom would have to include a standing shower with a waterfall showerhead and of course several jets. When I give a tour of my Dream Bathroom I want my future guest to be in all. I want to be able to open my bathroom door and for their jaw to drop. I want people to not just look in the bathroom. But actually, take a tour mesmerized by each detail. I have so many ideas that have me super excited about making my Dream Bathroom a reality. What's a must-have for your Dream Bathroom? Bathroom renovation enhances the look of your bathroom as well as add a space to the bathroom. You can find the list of Bathroom Renovation in Vaughan at gta-contractors.com. Oooooh, I would love a nice tub like that in my bathroom. I don't think I would ever leave the bathroom if I had one. Oh now your dream bathroom is just perfect, check out that roll top bath, yup that would be in my dream bathroom as well. That vanity looks amazing! I would love to have a wall with magnetic boards to store and display my makeup and nail polish. Great picks. Love that footed tub! I think they make a bathroom look so dreamy! I'm not sure what I'd like most... the tub or the vanity, but I think I'm going to go with the tub, granted given that the kids let me soak for more than 5 seconds! We are redoing 2 bathrooms in our house and my must haves are lots of counter space and bright lighting. We have a great tub in our main bathroom, but big showers are also a necessity. A luxury tub is a must for my Dream bathroom. I would need one big enough to soak in! I would have to have a big garden tub. I love to take nice long baths in a tub like that. I would surely love a hot tub for my bathroom and partner it with Jacuzzi to loosen those tired muscles. This would make every visit in the bathroom really a relaxing experience. I would love a claw foot tub so much. We have a deep soaker tub and I absolutely adore it! I’m sure that many people would love to have these bathroom items! I for one would love to have a new vanity in our bathroom. If we were to renovate our bathroom, I would love to have the new modern looking bath tubs, a glass shower enclosure, and a really pretty vanity! My dream bathroom would include a bathtub like the one you mentioned, but slightly bigger. And a view of the mountains. But the things you mentioned in the post are absolutely essential to any dream bathroom. I love the idea of a big soaker tub! One day we will upgrade our master! My dream bathroom would be a bigger bathroom. I like my bathroom but it is on the small side. I love these ideas! I am right there with you on wanting a big soaker tub! At the end of a long day being able to relax in a warm bath sounds amazing! I love to have a tub in my bathroom too but space is limited. A good lighting and a vanity is a must though. 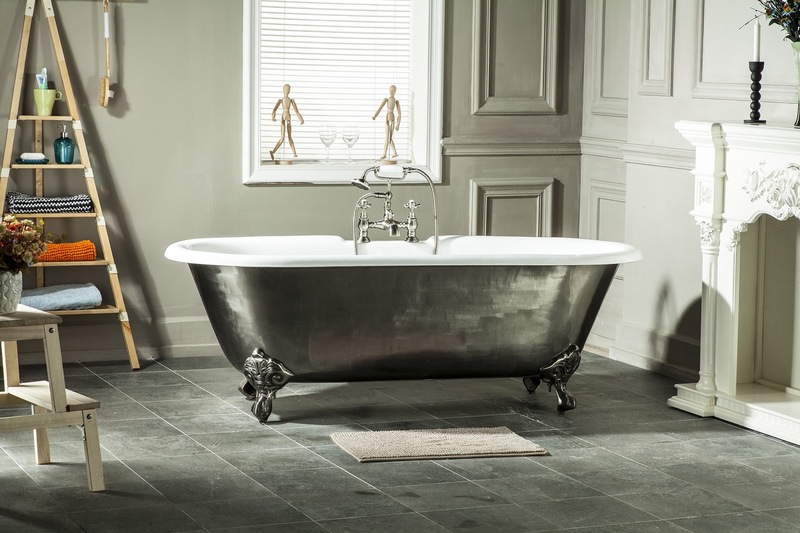 I have always dreamed of a gorgeous clawfoot tub. I've had them in bed and breakfasts but not in my home. Yet! I dream of one of those showers that has jets all over it and not just a shower head. That would be my dream shower. That bathtub is indeed part of a dream bathroom. It's very beautiful and can be the focal point of the room. The tiles perfected the beauty of the bathroom as well.